I bet you know at least a couple people or more who do freezer cooking days once or twice a month. They do this to save both time and money in the future, and it pays off for the most part. But what about those of us who don’t have a big chest freezer? I only have the freezer that came with my fridge, so I don’t think doing freezer cooking days would make much sense. Even though I don’t do freezer cooking days, I still save a lot of time and money by filling my small freezer. 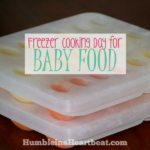 I have done freezer cooking days a few times in the past as well as a few baby food freezer cooking days, but other than that, I have been able to fill my freezer without doing any freezer cooking days. Make extra for dinner and freeze it. 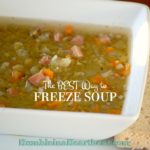 Freeze leftovers that we don’t get around to eating within 3 days. Put any raw meat or produce (usually found on sale) in there that I know we won’t use before it goes bad. One other thing I do occasionally is buy produce at super low prices and do what I can with all of it and then freeze what is left. For example, this past summer we got a huge box of peaches and I was able to make a ton of peach puree for my baby and store it in the freezer. We also got a box of tomatoes and made tomato sauce and then peeled and diced the tomatoes we couldn’t eat fast enough and threw both the sauce and the diced tomatoes in the freezer in freezer bags. Over time, these practices actually fill up my freezer and we can rely on a lot of the food to get us through busy days or times when I’m feeling lazy (it happens!). By doing those 4 simple things, you can save yourself a lot of time and money. You can take a day “off” of cooking if you have enough of one meal in the freezer. Just throw together a quick side dish to go with the freezer meal and call it a day. 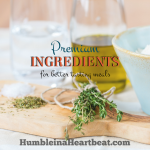 If you make lunch for your husband, consider giving him a “freezer meal” every so often. It would be especially helpful on mornings that you are running late. When you have extra minced garlic, diced tomatoes, or lemon zest (and many other foods like this) you can just throw them in little baggies into the freezer. Then when you need a small amount of one of those ingredients in the future, you don’t have to take the time to chop or grate. You don’t have to go shopping in between shopping trips. It takes time to get in the car and drive to the store to get food. 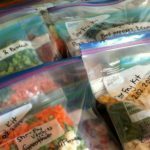 You are saving a lot of time that way if you prepare just a little more each meal to put in the freezer. 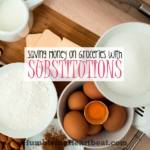 If you have a full freezer, the money savings can be phenomenal. Just make sure to eat all that food before it goes bad or gets freezer burn. Had a busy day? Ordering takeout sounds tempting, but if you have a freezer full of a variety of foods, you can easily get something out to thaw in the microwave or put in the oven. You’ll save at least $20 or more since takeout can be so expensive. It’s also easy to think that going to the grocery store to pick up a few more items to complete your meal is necessary. Not so if you are prepared with food in the freezer! Save that gas money and go on a date. TV dinners, frozen pizzas, and chicken tenders are so convenient, but they really are very expensive compared to making your own meals. So if you decide to freeze your own food, you aren’t going to be tempted by the convenience of the freezer aisle. Put your money savings towards a vacation. When my husband takes something from the freezer for lunch, he’s not going to spend $10 on lunch that day. Talk about a HUGE money saver. I always say that throwing away food is like throwing away money. If you’re putting leftover food into the freezer BEFORE it goes bad, you are definitely going to save money. If you need even more ideas on foods that can easily be frozen, check out this AWESOME resource. 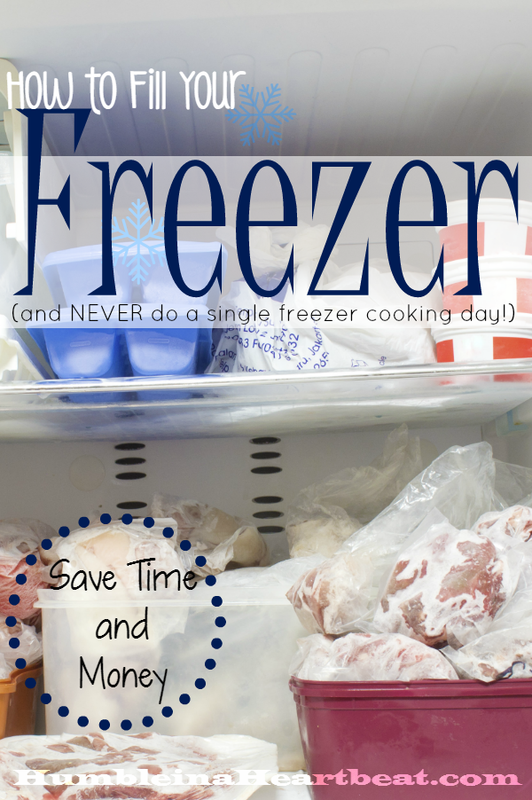 Are you in the habit of filling your freezer to save time and money? I like the idea to add your own sweetener to the yogurt along with some fruit. I’ll try that! Thanks for stopping by, Julie! when the leftovers in the fridge are low. for your next batch of soup or to season rice or quinoa. I love having a veggie scraps bag in the fridge! Organic veggies aren’t cheap and I want to use every last bit of them. These are seriously fantastic ideas, Anna!! I have to know more about the jars. Are they glass jars that you save from say, jam? How exactly do you reheat them? I love the idea to save all those scraps with the garlic to make veggie broth. I actually don’t buy organic veggies, but that is definitely going to help you use them to their max to get the most value out of them. Thanks for the ideas! You can only freeze jars that have no shoulders. They need to be wide-mouth with completely straight sides. Otherwise the jars will break. There is a blogger out there somewhere (not recalling which one at the moment) who did test jars and I think there is a way to reuse jars that involves laying them on their sides. But since I don’t have enough freezer space to do that I just buy freezer jars. They don’t make quart size that are freezable that I can find. They do, however, make a 24oz (pint + half) size. I need the open/wide mouth anyway in order to loosen the frozen contents from the outside in order to dump it into a pan or the slow cooker. I tend to use the pans more now because this already cooked food just overcooks if I leave in the slowcooker on low all day but only takes 30 minutes or so to defrost in a pan. (Especially soups & chilis.) I’m adamant about using glass because of the health concerns that come with storing food in plastic. I have had hormonal issues and the chemicals in plastics can play a role. I haven’t tried freezing any “casserole” type dishes but I would consider this is there was one we would eat that was freezer worthy. I would consider heating a food that was thicker in my rice cooker as I did when I reheat those thick types of leftovers from the fridge. (we don’t have a microwave). In fact, I do freeze cooked brown rice sometimes and then defrost and reheat in the rice cooker. I will say that I make it a habit to keep the rice or pasta separate from the soup because it doesn’t freeze well in the soup. My family knows to put the rice in the bottom of the bowl and then ladle soup on top. This way they can be frozen and when they reheat they don’t mush the rice. In fact, 2 members of my family can’t have wheat (not even gluten-free) and so I make a chicken veggie soup and then have rice and pasta separate so that some can have pasta and others use the rice. Potatoes freeze okay in the soup but the texture does change a bit. Hubby and I don’t mine it. We don’t make/freeze cheese or cream soups but I bet those wouldn’t handle the freezer well either. Did that answer your questions? So much great information, Anna! Thank you, and yes you answered my questions. 🙂 I really never realized there were freezer jars, so I’ll have to look for some of those. Such good, useful tips Charlee! I often make a little more for dinner but usually we eat the leftovers within a day and I never have enough to freeze. Although when I bake, I always make lots so that I can freeze muffins, cookies, breads, etc. Thanks so much for sharing. I appreciate these tips so much! Yea, this can often happen to us since my husband and daughter are pretty big eaters! When I get my big chest freezer, I’ll be baking a lot more so I can freeze goodies and bread. I’m glad the tips are helpful! I do the same thing and find that it is a lifesaver! I rarely have the time to do entire days of freezer cooking, but doing a little bit at a time really adds up. I often bake 2 loaves of bread and freeze one (pre-sliced for toast or grilled cheese). My hamburger bun recipe (on my blog) makes enough for 2 meals, so we eat some fresh and freeze the rest. I often double casseroles, pot pies, etc. when I am making dinner and freeze one. I also love making a batch of freezer burritos (recipe on my blog) and pizzas for the freezer. 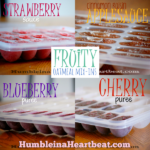 They not only freeze well, but are cheaper and healthier than purchasing from the store. Another favorite is cookie dough! Then I can have fresh-baked cookies in a matter of minutes. Thanks for the post, Charlie Anne! Haha! I don’t blame you about the cookies. I would probably pull out the dough to eat it plain whenever a sugar craving kicked in. I will have to check out your bun and burrito recipes! I might have been guilty of that a time or two. Make extra for dinner and then freeze it; that’s the best advice that I always forget to follow. I think maybe it’s because I’m not in the habit of buying double when we get meat, and so I’m left with just enough for that meal and perhaps a dish of leftovers or two. I’ll try to get in the habit. It’s not hard to make doubles, it just takes a little thought when I’m buying protein from the store (or digging it out of the freezer). Fair enough. You could save even more money by just halving the amount of meat required. Unless, of course, that doesn’t go over well with your family! Even if I forget to double a recipe, we usually have plenty of leftovers since our kids are still little so the both of them eat as much as one adult. If a recipe serves 4-6, we’ll definitely have leftovers. I really like making meals that serve 10-12!